This chart shows a serious problem. That giant gap consists of Americans who are unemployed, and couldn’t get a job even if they wanted to. This emphasizes the need for Congress to extend unemployment benefits. It’s pretty clear that millions of Americans remain unemployed because the jobs aren’t there — not becuase they aren’t trying hard enough to find them. In fact, it’s not even close. I’m sympathetic to the notion that we need to constrain government spending. But this seems a particularly cruel bill on which to make that stand. And, aside from the “but Republicans support tax cuts for the rich while railing against deficits” canard, there are all manner of more expensive, wasteful programs to cut. I’m also sympathetic to the philosophical objections. There’s simply no question, as Daniel Hamermesh points out that we have “huge amounts of research showing that extending the potential duration of unemployment benefits creates an incentive for the unemployed to search less and remain unemployed longer.” How could it not? But, as he points out, “most of the research describes behavior in average economic times, not when the unemployment rate is 9.5%. What little research is available suggests smaller effects when there are fewer job vacancies.” And, needless to say, there are fewer job vacancies right now. The world economy has been in the toilet for two years now and there are strong signs things will get worse before they get better. You know that really annoying contrarian? Maybe he was in your grad school seminar. Or, perhaps, he was part of a listserv on public policy. Whatever. He was the guy who was always telling everybody they were wrong and–this is the annoying part–he often turned out to be right. You wished he weren’t around, but you were also glad that he was. The 2009 data won’t be out until later in the year, but if last year ends up comparable to the depths of the early 1980s recession, then the average worker will “only” have had a seven in nine chance of avoiding unemployment. *** But these figures overstate economic risk because some unemployment is voluntary and much of it is brief. According to the Congressional Budget Office, the chance that a worker experienced an unemployment spell lasting more than two weeks during the three years from 2001 to 2003 was just one in thirteen—a period covering the last recession. So as I’ve been following the debate about unemployment insurance and whether it actually worsens the unemployment rate, I’ve actually been open to the idea that being able to receive benefits for up to two years might create perverse incentives. The research is not as uniformly dismissive of the idea as some liberal assessments have implied (go to NBER’s website and search the working papers for “unemployment” if you want to check this out yourself). In particular, the idea that there were 5 people looking for work for every job opening struck me as sounding overly alarmist. So I started looking into the numbers to determine whether I thought they were reliable. The figures folks are using rely on a survey from the Bureau of Labor Statistics called the Job Openings and Labor Turnover Survey, which unfortunately only goes back to December of 2000. But the Conference Board has put out estimates of the number of help wanted ads since the 1950s. Through mid-2005, the estimates were based on print ads, as far as I can tell, but the Conference Board then switched to monitoring online ads. You can find the monthly figures for print ads here and the ones for online ads here. 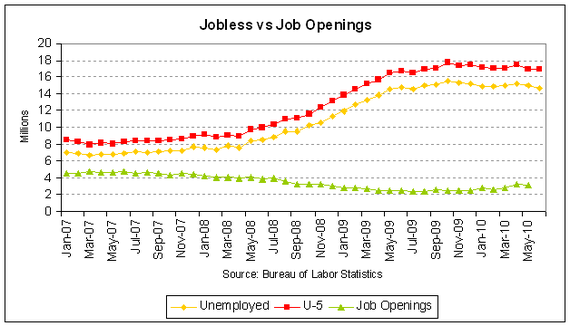 The JOLT and unemployment figures are relatively easy to find at BLS’s website. I’ll just say I was shocked and that I am much more sympathetic to extension of unemployment insurance than I was yesterday. I don’t think people should be dismissive of the idea that unemployment insurance has a disemploying impact on incentives. And that’s why in normal times you don’t want to offer an unlimited amount of unemployment insurance. But faced with a massive gap between the number of people looking for work and the number of job openings, this just doesn’t matter as much as it otherwise would and the humanitarian and aggregate demand impacts are way more important. Lasting unemployment takes a toll on families, takes a toll on marriages, takes a toll on children. It saps the vitality of communities, especially in places that have seen factories and other anchoring businesses shut their doors. And being unable to find work – being able to provide for your family – that doesn’t just affect your economic security, that affects your heart and your soul. It beats you up. It’s hard. Workers who are out of work—especially workers who are out of work for a long time—lose a good deal of their market-relevant human capital. Their networks of contacts that allow them to easily get and change jobs, their habits of punctuality, their workplace skills, and their self-esteem all erode. The long-term unemployed, especially, drop out of the effective labor force—and it is damnably hard to reattach them all to employment absent a full-scale World War II-style inflationary boom. [U]nemployment insurance puts money in the pockets of the families most likely to spend the money – which in turn expands the economy and creates jobs. The nonpartisan Congressional Budget Office has identified increased aid to the unemployed as one of the two most cost-effective policy options for increasing economic production and employment. Missed unemployment insurance payments since May total over $10 billion – enough to have created 100,000 jobs. That’s a fair point, but the 100,000 jobs created by those payments are clearly insufficient to employ the 2.5 million unemployed affected by the lapse in benefits. What should be clear is that America’s current unemployment policies are woefully unprepared to handle a labour market like the present one. As important as it is to keep families out of destitution, it’s also necessary to focus on ways to keep unemployed workers in those families attached to the labour force and prepared to get and succeed in a job when one is finally available. Otherwise, the long-term unemployed will linger on growing ever less employable, joblessness will become structural, and America can get ready to face its own bout with European-style hysteresis. 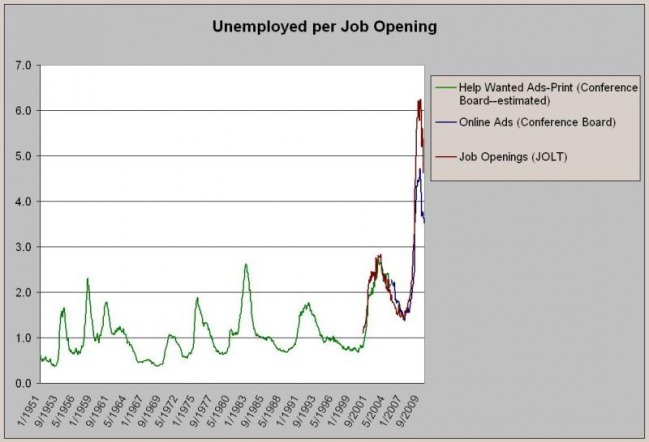 Scott Winship has a powerful post on the ratio of job openings to unemployed workers. The numbers are sobering, and speak to Smith’s broader point. Yet if we do make it out of this cyclical downturn, as I believe we will, what will the economy look like on the other end? I think that’s an important question, and it’s the question that I tend to dwell on, though I can see why some might find that frustrating given the urgency of the immediate unemployment crisis.